Looking for a unique way to top off an unforgettable graduation party? 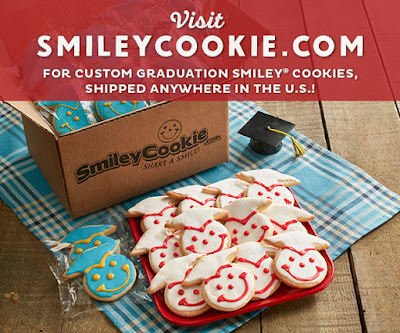 Look no further than our online store at SmileyCookie.com, where you can celebrate with a smile and graduation cookies! Our graduation cookies can be customized to fit your grad's school colors, and are available by the dozen, or individually-wrapped in packs of 50 or 100 for larger parties. They're baked fresh and hand-iced, and can be shipped anywhere in the U.S.
All of the cookies from our online store, including these graduation cookies, are nut-free and kosher-certified. Click here to order your graduation cookies today!